Winter is in full swing, but soon spring will be upon us, exposing your roof for the first time in months and allowing you to see how well it fared the cold and snowy season. If you find that your roof is in shambles after a season exposed to ice and snow, you may be able to make piecework repairs, but it may be better to replace your roof altogether. If you’re thinking of replacing your worn roof or if you’re constructing a new building, one leading option to consider is a rubber roof. A perfect option for structures with a low sloped or flat roof, rubber roofing offers a range of benefits for commercial and industrial structures. 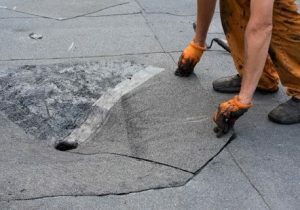 To start, rubber roofing is incredibly easy to repair. Unlike many traditional roof styles, where you may need to tear up worn tiling before placing new material down, you can simply cut out worn or damaged areas of a rubber roof to make quick and easy fixes to your roof. Rubber roofing is also a great option for another reason: cost. Rubber roof materials are typically much less expensive, both at installation as well as during maintenance and repairs. It also is incredibly waterproof, meaning you will have a far reduced concern about water penetration than you would with tar or shingling. Finally, rubber is also a very durable and long-lasting option, as well, with roofs often lasting 30 years or more before needing to be replaced. This provides you with a reliable roof that will last for decades. The professional team at Roofing by Bruce can handle the roofing installation, maintenance and repair needs at your business in East Stroudsburg or elsewhere in the Pennsylvania Poconos. Our team can assess your situation on site, advising you on your options and providing you with a quote for your needs. Call the Roofing by Bruce team today at 570-424-7250 to learn more or to schedule an appointment for an estimate.